The man is a beast on the M1 that is for sure! very excited about Aprilia and KTM next year, hope they can mix it up in the top 5. 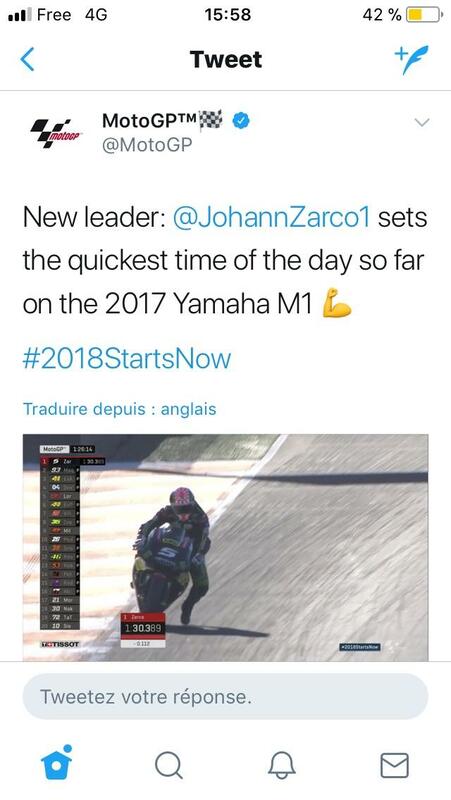 It seems Zarco likes the 2017 bike. KA daddy owns the race team and the track that motoGP races on i think its assan. that would explain why he is still there. thats it brno i knew it was one of the tracks. ABR that you see on the side of the ducati is abraham racing. i mean if i owned the yankees i would be in center field . We all got a bonner when Vinales did the same thing on the M1 last year after he jumped from Suzuki...... that didn’t really work out as most people expected. Last edited by jock39racer; Nov 14th 2017 at 11:30 AM. ok first its been raining since sunday here in south florida and i did not anticipate that or all the tissues needed after the race. second vinales did do the same thing however does this make you scratch your head at all be honest. the original 2017 Yamaha worked perfectly with the original softer version of the Michelin. do we agree here as maverick dominated testing and won 3 of 5 races. the tire was there for 16 till it magically disappeared because jorge was dominating pre season with it. come to 2017 with Lorenzo gone, Rossi actually asked for a softer Michelin as a way to foil Marquez as marquez prefers harder tires as he breaks very hard. it worked at the start where Yamaha were clearly ahead of Honda and Ducati. then what happened? Rossi didn’t anticipate Vinales instant speed. The Yamaha was pretty much perfect do we agree here? the engineers have delivered for years. Tire 070 took care of all that, and it did it’s job perfectly even if Yamaha are now behind because it has put Rossi back as the go to rider for development. could this be true you tell me?